Electronicsvalley (Top Rated Plus seller w/ 99.7% feedback rating) via eBay Daily Deals is offering the current gen 13.3-inch MacBook Pro with Retina Display 2.9GHz/8GB/512GB (MF841LL/A) for $1,469.99 shipped. That’s $329.01 below the regular price. Apple charges $59 more for this model in refurbished condition. 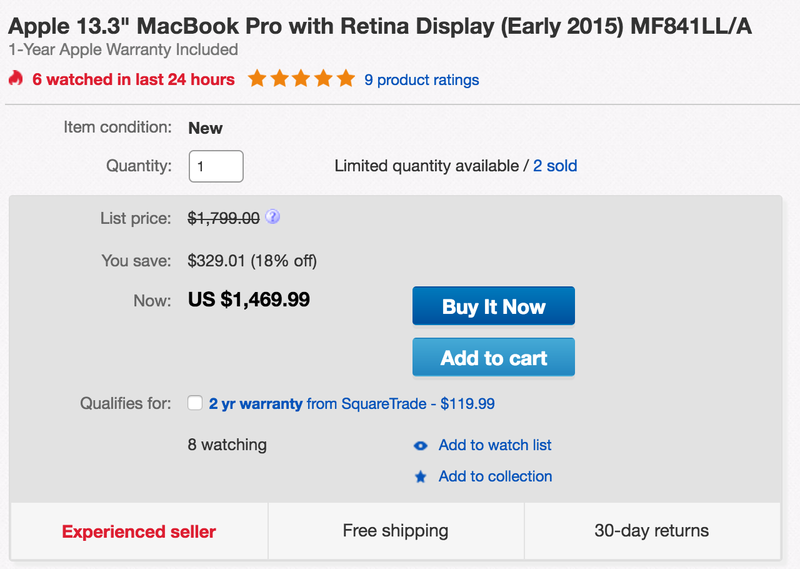 We don’t tend to see deals as often on the high-end 13-inch MacBook Pro. Features include a 2560-by-1600 resolution Retina display, 8GB of RAM, 512GB of flash storage, 720p FaceTime camera and more. While the new generation MacBooks are expected this month, you likely won’t be seeing this nice of a discount on those for a while. Stay locked to 9to5Mac over the coming week or so for all the latest news on the next gen MacBooks. Use your savings to buy our all-time favorite laptop stand and a beautiful Mac-friendly external monitor.